Academic Technlogies is thrilled to share Ana E. Campo-Bowen, M.D. Associate Professor and Assistant Dean for Student Services is this year’s recipient of the George Paff Teaching Award at University of Miami's Miller School of Medicine, through exploring new blended approaches, and lightboard technology within a neurosceiences course. 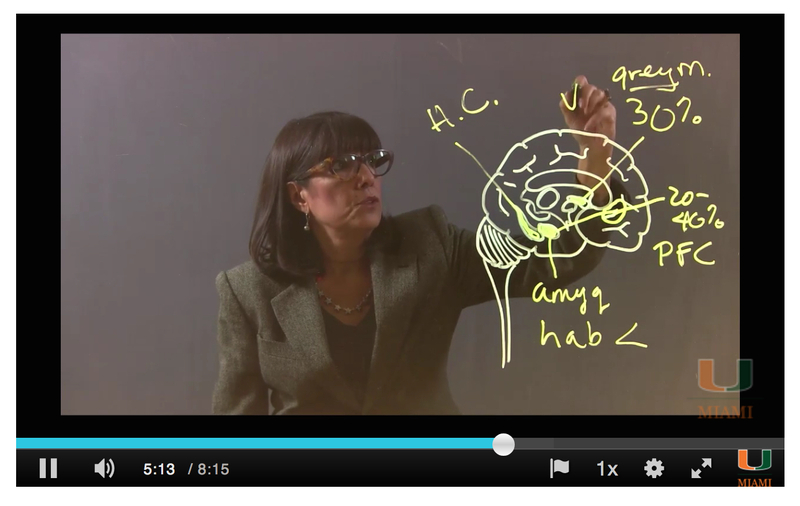 For the neurosciences course that the department of psychiatry teaches to first year medical students, Dr. Ana Campo’s eleven lecture hours (depression, bipolar, treatment of depression, treatment of bipolar, suicide, eating disorders, normal growth / development, and autism) were converted into three online learning modules, where blended learning approaches and lightboard technology were used. Students commended Dr. Campo on her innovation, creativity and willingness to step outside of the traditional lecture-type setting within the psychiatry aspect of their neuroscience course. The George Paff Teaching Awards are named in honor of George Paff, Ph.D., one of UMMSM’s founding faculty members. In his honor, students in each class present “Paff Awards” to faculty they consider the most inventive and inspirational teachers. This year, Dr. Campo was chosen as a Paff award recipient by nomination of the student body. Reserve the Faculty Exploratory to use the One Button Studio. Connect your personal USB flash drive to turn on the One Button Studio. Align the Lightboard to the camera, then adjust the board to your preference. Connect the Lightboard power cable and turn on the LED lights. Use the provided neon markers to write on the board. Press the “One Button Studio” button to begin recording, and press again to end the recording session. During post-production, use the crop-filter tool in iMovie to flip the recording. More information on the One Button Studio and the Lightboard can be found on the Faculty Exploratory page. Assistance is available upon request via the reservation form.